Emerald mountain range, Green Meadows and White clouds combine to create a dreamy locale for you. Nature never goes out of style. And this place is a perfect example for that. Valley Of Flowers is a dazzling and magnificent National Park reposing in West Rishikesh. Snuggled in Uttarakhand, this enchanting place is famed for its endearing meadows of alpine flowers. Enriched with a sundry range of endemic flora, it is scenic in its beauty. This fertile region is also the home for threatened animals. You may spot animals like Snow Leopard, Musk Deer, Red Fox, Asiatic Black Deer, Brown Bear and Blue Sheep. Valley Of Flowers is situated 300 Kms North Of Rishikesh, Near Badrinath. It is placed within the district Chamoli. The nearest town is Ghangharia after Joshimath. Acolossal expanse of 87.5 sq Kms and innumerable alpine flowers makes this place beautiful heaven. It is in Pushpawati valley 23 km north-northwest of NandaDevi Park. You need to travel by road till Govindghat, and from there the trip To Valley of Flowers Starts. Govindghat is located 20 Kms before Badrinath. Till Govindghat you can go through a motorable road. It opens at7:00 am every day & you will be allowed until 2:00 pm. You need to get out of the valley within 5 pm. Take your entry ticket sooner to get witnessed of the magnificent charm. The best time to visit valley of flowers based on how you like to get a glimpse of this paradise. 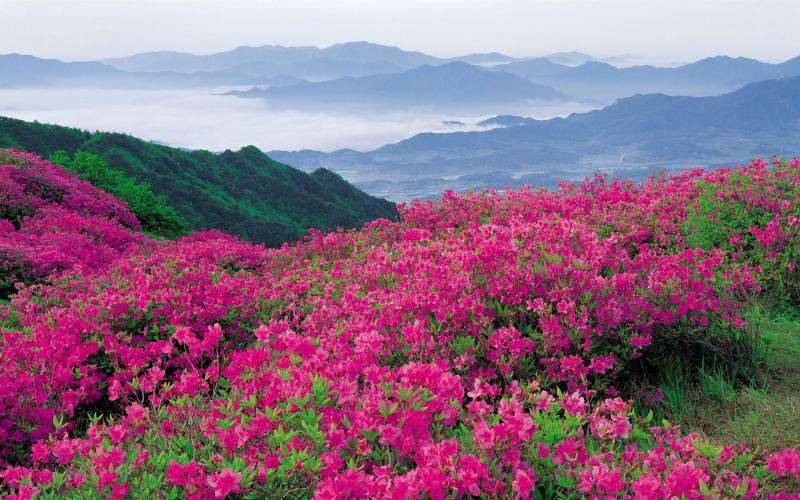 You can perceive the paramount number of flowers in July and August. So, get ready and pack your bags to visit the marvellous enchantress of the place. There is no place for accommodation inside the park because it is a one day’s voyage to visit. Carry your foods. You can take snacks and beverages, and you need to carry water bottles. You can obtain your accommodation at Ghangaria. Though it is a high altitude Himalayan valley, it is a place of appreciation for mountaineers. It is the ultimate prepossessing destination for Trekking Lovers. Acquiring to the valley of flowers you need a trek of about 17 km. Govindghatis a small place close to Joshimath from where the trek begins. From Govindghat you can hire a taxi up to 4 Kms, and then your Trek journey starts for 11 Kms. You can also hire a helicopter to reach Ghangaria. The trekfrom Govindghat to Ghangaria is the path through the Sikh temple at Hemkund. Asa trekker, anyone would love to visit Sikh Pilgrims. The track is hailed by aromatic wild flowers, wild rose bushes and wild strawberries. The visitors need to get an authorisation from the Forest Department, and The permit will be granted for three days. The trekking will be allowed for daytime only. You can get the witness of rare, endangered animal species. Along with the flowers, you will get the evidence of wild bees and butterflies. Make a plan travel lovers and set your next goal at this marvellous destination.